Anthony Morales is a U.S. Army veteran who lives in Bakersfield and was selected to compete in a golf tournament called the Warrior Open, which is put on by the Bush Institute. 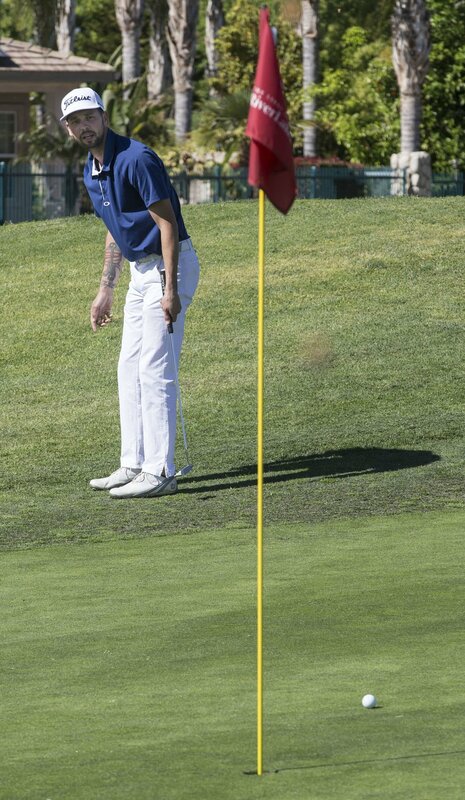 Anthony was practicing at River Lakes Ranch Golf Course Friday afternoon. Anthony Morales is a U.S. Army veteran who lives in Bakersfield and was selected to compete in a golf tournament called the Warrior Open, which is put on by the Bush Institute. Anthony just missed a long putt while practicing at River Lakes Ranch Golf Course Friday afternoon. Anthony Morales is a U.S. Army veteran who lives in Bakersfield and was selected to compete in a golf tournament called the Warrior Open, which is put on by the Bush Institute. Morales was practicing at River Lakes Ranch Golf Course Friday afternoon. Anthony Morales shares a tattoo on his forearm dedicated to friends in his unit who died in the war. Anthony is a U.S. Army veteran who lives in Bakersfield and was selected to compete in a golf tournament called the Warrior Open, which is put on by the Bush Institute. Anthony Morales is a U.S. Army veteran who lives in Bakersfield and was selected to compete in a golf tournament called the Warrior Open, which is put on by the Bush Institute. He deployed to Afghanistan in 2010 and was hit with an RPG. Morales turned to golf to work through his post-traumatic stress. Anthony Morales never saw the rocket-propelled grenade that could have killed him coming. He didn’t feel the heat of it, like with another RPG that passed over his head earlier in the firefight. When it hit, he didn’t know that it had. He looked down to see blood squirting out of his arm, while also taking cover from accidental friendly attack helicopter fire. Morales, a Bakersfield native then enlisted in the United States Army, was with his platoon in Taliban territory in the Nerkh (also spelled Nirkh) district of Wardak Province, Afghanistan on June 29, 2011. Because of the way he was holding his light machine gun, his left wrist was propped up in front of his neck. The shrapnel sliced open Morales’ wrist and some embedded under his skin. He kept fighting with his arm bleeding for about another hour because about one-third of the platoon had already been knocked out of action with injuries in that fight. Morales wrote about that day in a letter to the Bush Institute, which earned him a spot at the Warrior Open in Dallas in May. The Warrior Open is a golf tournament that honors U.S. service members wounded since Sept. 11, 2001. Morales, who still lives in Bakersfield with his wife, Gia, and two children, will compete against 23 other service members on May 5 before a pro-am the next day at Trinity Forest Golf Club. Though he struggled with substance abuse immediately after returning from deployment, Morales has used golf, writing and his family to cope with his traumatic experiences in Afghanistan. Morales enlisted in the Army three days before his 21st birthday. Even though his test scores made every path available, he chose infantry. He graduated from basic training in June 2010, moved on to airborne school after that and then was assigned to Fort Polk in Louisiana, where he joined part of the 10th Mountain Division. He joined his unit in September and was deployed by October. Morales developed a reputation for bringing levity to the seriousness of war. He concocted the idea of answering a radio transmission at 2 a.m. from the tactical operations center as if he and the others at the observation post were a commercial radio station taking calls. Before a 10-day stint at the observation post, Morales and a few others stole the only pack of the card game Monopoly Deal from the joint security station. It was about an hour-and-a-half trek going from 7,400 feet of elevation to 8,500 feet from the joint security station to the observation post. After holding the cards hostage and demanding ransom, Morales built a glider out of scraps, pretending to attach Monopoly Deal and throw it down to the joint security station. In reality, he didn’t attach the cards, doused the glider in gasoline and lit it on fire, claiming that the Hezb-e-Islami Gulbuddin shot it down. Morales’ platoon engaged in firefights with militia and Taliban forces consistently, often multiple times per week. As much as Morales feared the battles, he craved them too. Though Morales had taken the shrapnel from the RPG and was knocked unconscious for more than two minutes while manning an automatic grenade launcher during a “search and destroy” mission an earlier time, the reality of war hadn’t completely set in. On Aug. 3, 2011, Morales’ was the first truck on the scene where another Army truck had hit an improvised explosive device. Cody Baker and Gil Morales Del Valle were in the truck that hit the IED. Morales Del Valle, who Morales called Little Mo, had been pulled out and was on the side of the road. Baker was crushed by the truck. After he returned from Afghanistan, Morales turned to drinking and drugs. The joke at the time was that he put the run in drunk because he would show up to physical training intoxicated and run five miles. He occasionally abused painkillers. Morales left the Army after three years enlisted and eventually made his way back to Bakersfield in August of 2013. Including the toothpick-sized piece of metal still in his wrist, his Army experiences stuck with him and made him a harsher person. In 2014, Morales was working at his family’s precast concrete business when he lashed out at his cousin. Morales felt like he blacked out. So he took a few days off, played golf and decided to correct his path. Morales had played golf ever since he got his first Little Tikes toy set when he was 3. When he was little, Morales’ form of daycare was to spend all day at Valley Rose Country Club in Wasco. It was there that Morales developed his love of the game, hit his first hole-in-one and won his first tournament. He played just once during his time in the Army but when he picked it up again, the challenges of the game were therapeutic. “It makes you think about other things than what happened,” Morales said. Before Morales was deployed, his uncle, a Vietnam veteran, handed him a few notebooks and told him to write down everything that happened. Morales did keep some notes and continues to write about his thoughts and feelings. Reading them back over helps him process the experiences, he said. “The minute you try and limit traumatic experiences from coming out is the minute they’re gonna start eating away at you,” Morales said. “You kind of have to embrace them. Hey, this happened It’s not gonna unhappen. Good luck in the tournament Mr. Morales. You have earned the spot and we thank you for your service!